The polymerase chain reaction (PCR) is a laboratory technique for DNA replication that allows a “target” DNA sequence to be selectively amplified. PCR can use the smallest sample of the DNA to be cloned and amplify it to millions of copies in just a few hours. Discovered in 1985 by Kerry Mullis, PCR has become both and essential and routine tool in most biological laboratories. The PCR involves the primer mediated enzymatic amplification of DNA. PCR is based on using the ability of DNA polymerase to synthesize new strand of DNA complementary to the offered template strand. Primer is needed because DNA polymerase can add a nucleotide only onto a preexisting 3′-OH group to add the first nucleotide. DNA polymerase then elongate its 3 end by adding more nucleotides to generate an extended region of double stranded DNA. DNA Template : The double stranded DNA (dsDNA) of interest, separated from the sample. DNA Polymerase : Usually a thermostable Taq polymerase that does not rapidly denature at high temperatures (98°), and can function at a temperature optimum of about 70°C. Oligonucleotide primers : Short pieces of single stranded DNA (often 20-30 base pairs) which are complementary to the 3’ ends of the sense and anti-sense strands of the target sequence. Deoxynucleotide triphosphates : Single units of the bases A, T, G, and C (dATP, dTTP, dGTP, dCTP) provide the energy for polymerization and the building blocks for DNA synthesis. Buffer system : Includes magnesium and potassium to provide the optimal conditions for DNA denaturation and renaturation; also important for polymerase activity, stability and fidelity. All the PCR components are mixed together and are taken through series of 3 major cyclic reactions conducted in an automated, self-contained thermocycler machine. This step involves heating the reaction mixture to 94°C for 15-30 seconds. During this, the double stranded DNA is denatured to single strands due to breakage in weak hydrogen bonds. The reaction temperature is rapidly lowered to 54-60°C for 20-40 seconds. This allows the primers to bind (anneal) to their complementary sequence in the template DNA. Also known at extension, this step usually occurs at 72-80°C (most commonly 72°C). 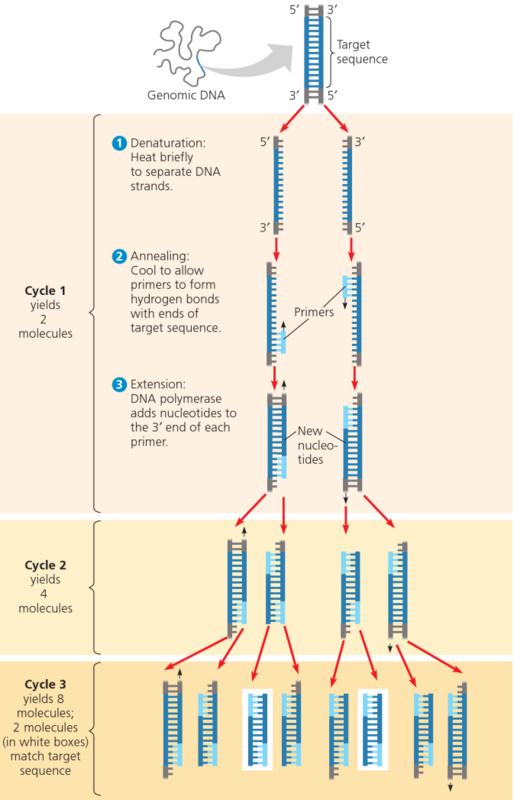 In this step, the polymerase enzyme sequentially adds bases to the 3′ each primer, extending the DNA sequence in the 5′ to 3′ direction. Under optimal conditions, DNA polymerase will add about 1,000 bp/minute. In addition to the amplification of a target DNA sequence by the typical PCR procedures already described, several specialised types of PCR have been developed for specific applications. Some common applications of PCR in various fields can be explained in following categories. 2. Detection of disease causing genes in suspected parents who act as carriers. 1. Analyzing clinical specimens for the presence of infectious agents, including HIV, hepatitis, malaria, tuberulosis etc. 2. Detection of new virulent subtypes of organism that is responsible for epidemics. 1. In genomic studies: PCR helps to compare the genomes of two organisms and identify the difference between them. 2. In phylogenetic analysis. Minute quantities of DNA from any source such a fossilized material, hair, bones, mummified tissues. 4. In Human genome project for aim to complete mapping and understanding of all genes of human beings. Sir, V.good topic plz continue it. sir very happy this notes thank you..
A very lucid and explicit note for easy understanding. Looking forward to reading more of it kind. Straight to d point, rily helpful, tnx sir.